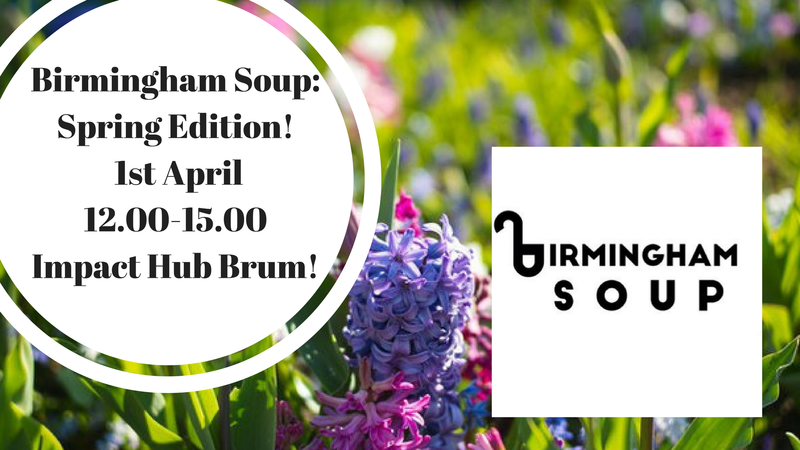 Spring’s Birmingham Soup takes place on Saturday 1st April, doors open from 12.00 pm at Impact Hub Birmingham and project stories start at 1.00 pm. Applications for April’s event are now OPEN – deadline is Weds 22nd March, 2017. Join us for a public soup dinner! Pay a suggested donation of £5 or more (£1 for kids). Learn about creative/community projects happening in Birmingham. The goal of Birmingham SOUP is to offer a safe space where people can gather and share a meal to encourage conversation, relationship building and resource sharing while supporting creative community projects in Birmingham. We want to be democratic, creative, sustainable and inclusive. SOUP is a great way to raise money, build community support and get connections to local resources that can help you carry out your project. If you would like to pitch a proposal at Birmingham SOUP please take a moment to read our rules and application process info below before submitting your form. -The idea must benefit the Birmingham community, we want to be democratic, creative, sustainable and inclusive. Your proposal should be short, quick and to the point! Your idea can be about ANYTHING! The idea must benefit Birmingham. When you hit the word “submit” a screen will prompt you that we received your application and it is being processed. If your idea doesn’t get selected for this months soup SUBMIT AGAIN NEXT TIME! Only 4 submissions are chosen to share at each SOUP, so sadly not everyone gets through. Save your work. Save it in case you want to resubmit later. Anything you submit (except for your contact details) will be used either online or at the dinner, so make sure you edit, look for spelling errors, etc. We DO NOT use technology to present, no powerpoint – we just hear from the people and their ideas. Each project has 5 minutes to present their idea to the dinner and could go home with all the door money to start things off! Contact birminghamsoup[@]gmail.com if you have any questions or need help in filling out the application form.